Vladimir Putin has been either the president or prime minister of Russia since 1999. When Putin took over, Russia's economy was growing 7 percent a year. That was due to former President Boris Yeltsin's push to transform the country from a command economy to a mixed economy. It was a rebound from Russia's 1998 debt default. Russia's growth continued thanks to high oil prices. But it went into a recession in 2015. That's a result of economic sanctions and low oil prices. 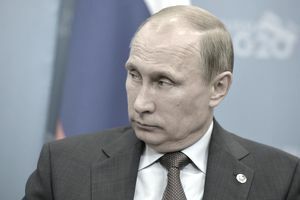 In August 2018, the United States imposed sanctions on Russia for using nerve gas. The sanctions prohibit sales of hundreds of millions of dollars of sophisticated U.S. equipment to Russian state-owned companies. The sanctions also ban all arms sales, terminate export licenses, and prohibit other military financing assistance. To prevent a second round, Russia halt the use of chemical and biological weapons and provide assurances that it won't use them. it must also allow international observers to verify that it is meeting these criteria. In March 2018, a nerve-agent attack was launched against a former Russian spy in the United Kingdom. A U.S. law mandates sanctions against a country that uses chemical weapons. This followed a 2006 poisoning of former Russian agent and British citizen Alexander Litvinenko. The sanctions are mandated by a U.S. law that requires action over the use of chemical and biological weapons—but President Trump maintains significant discretionary power over the degree of that punishment. On December 30, 2016, President Obama imposed sanctions Russia. He punished it for launching cyberattacks during the 2016 presidential campaign. The CIA accused Russia of hacking into the Democratic National Committee. The hackers also attacked presidential candidate Hillary Clinton's campaign. The hackers published the results on Wikileaks, deliberately sabotaging Clinton's campaign. That led to the Special Investigation of Russian interference in the U.S. presidential election. On October 30, 2017, Special Counsel Robert Mueller indicted three Trump campaign officials. One, George Papadopoulos, admitted he tried to connect Russian and Trump officials. The other two were charged with laundering money. They had received it from a Russia-friendly political party in Ukraine. On July 16, 2018, President Trump met with Putin privately for two hours. There were no U.S. officials present other than a translator. Putin met several times with each of the past four U.S. presidents. The discussions were recorded by official notetakers. Trump's staff, colleagues, and family members have many personal and business connections that lead to Putin. At a joint press conference following the meeting, Trump sided with Putin's denial that Russia hacked the election.In response, the U.S. Senate has hinted it would consider further sanctions against Russia. Putin invaded Ukraine's port of Crimea in March 2014. He said he was defending Russia's only warm-water port. He was alarmed after the overthrow of Ukraine's president and Putin's ally, Viktor Yanukovych. Russia then positioned troops on Ukraine's eastern border. He supported pro-Russian insurgents who attempted to take over that section of the country. The United States and the European Union imposed sanctions. But Putin's popularity with Russians soared for defending his country against the West. On September 30, 2015, Putin launched airstrikes against the Islamic state group in Syria. But U.S. officials said the Russian strikes were nowhere near known IS locations. Instead, it appeared Russia supported Syrian President Bashar al-Assad. The attacks put Russia in conflict with the United States, who supported local Syrians fighting IS and Assad. When Putin became president, Russia was bankrupt. It owed more to the International Monetary Fund than it owned in foreign currency reserves. In 2001, Putin pushed through many reforms. He instituted a 13 percent flat income tax. He reduced the corporate tax from 35 percent to 24 percent. He cut Social Security contributions from 39.5 percent to 26 percent and allowed deductions for business costs. He unified tax collection into one agency and decriminalized small tax violations. In 2002, he deregulated small business licensing. He also allowed privatization of farmland that had been collectives before. This reform boosted entrepreneurship in Russia and furthered growth. Feeling threatened by the power of some corporations, Putin reversed course in 2003. He nationalized the Yukos oil company. He sent its owner, Mikhail Khodorkovsky, to jail for tax evasion and fraud. He combined Yukos with the national oil company, Rosneft. Putin then sold shares of Rosneft to private foreign investors in 2006. In 2007, he did the same with the bank, VTB. Companies like Rosneft are managed by an oligarchy of Putin's allies and supporters. As a result, they have become wealthy. They are also the secret to Putin's power. According to the New York Times, Russia has been ruled by an oligarchy in one way or another since the 1400s. This impediment to a true free market economy is the biggest drag on Russia's growth. As a result, the nationalized industries of oil, gas, banking, and machine building have stagnated. Foreign direct investment has dropped, also slowing Russia's economy. The only saving grace is privately-held industries. These growing industries include retail, construction, and metals industries. Putin remains popular in Russia because he restored national pride. In 2007, Time Magazine named him its Man of the Year. Putin successfully applied for Russian membership in the World Trade Organization in 2012. That sent a message to the world that Russia adheres to international trade rules. Thanks to Putin's pipeline politics, Russia became the world's leading oil producer in 2011. It even surpassed Saudi Arabia. Russia is also the second-largest producer of natural gas, since it holds the world's largest reserves. It also holds the second-largest coal reserves and the eighth-largest crude oil reserves. Russia also exports steel and aluminum. Russia was hard-hit during the 2008 financial crisis, but high oil prices helped it recover quickly. In 2012, its gross domestic product rebounded to $2.6 trillion. But its growth rate slowed since the 1990s to 3.4 percent in 2012. It entered a recession in 2015 and 2016. The resurgence of U.S. shale oil and gas production threatens Russia's economy. Gazprom, the state-owned gas company, supplies a quarter of Europe's needs. As U.S. production rose, oil and gas prices fell. That, combined with the sanctions, further slowed Russia's economy. Russia's reserves will only supply another 20 years at current levels. It requires expensive investments to access further reserves in the frozen tundra. Putin needs to expand reliance on other industries where Russia has a competitive advantage. These include information technology, airplanes, and engines. Whether Putin can step up to the challenge remains to be seen. In 2013, Putin hosted the G-20 meeting in St. Petersburg. The discussion centered around whether the United States should send in missile strikes to warn Syria against any further use of chemical weapons. These were banned after their use in WWI. Putin opposed any military intervention against its ally Syria, which Russia supports with arms and trade. Liberalized the ruble, allowing the currency to be transferred in and out of Russia. Allowed Rosneft, the state-owned oil firm, to sell shares on the London Stock Exchange. Established trade agreements with Canada regarding Liquefied Natural Gas and uranium. Announced Russia’s partnership with the United States in the Global Initiative to Combat Nuclear Terrorism, reiterating Russia’s offer to sell enriched uranium to Iran. After Russia invaded Crimea, the other seven G-8 members voted Russia out of the summit membership. Putin was born on October 1, 1952, in Leningrad, now St. Petersburg, Russia. He became a martial arts expert at an early age. He earned a law degree at Leningrad State University in 1975. He joined the KGB, and recruited foreigners to gather intelligence for the spy agency. He lived as an undercover agent in Dresden, Germany, from 1985 to 1990. In 1991, he left the KGB to work for the mayor of St. Petersburg and became deputy mayor in 1994. He joined President Boris Yeltsin's "inner circle" in 1996. He was the deputy chief administrator of the Russian government building, the Kremlin. In 1999, he became Secretary of the Security Council. Later in 1999, Yeltsin appointed Putin as prime minister. Putin became acting president on December 31 that same year. Voters endorsed him in a March 7, 2000, election. He won re-election in 2004. Putin could not run for president in 2008, so his colleague Dmitry Medvedev became president. Putin took the office of Prime Minister. Putin was re-elected president to a six-year term in 2012.